TWIN valley fruitgrower Reid Fruits will represent Tasmania at the 52nd Australian Export Awards after recently being named the 2014 Tasmanian Exporter of the Year. Established in the Huon Valley in 1856, the business also has 100 hectares of cherry orchards in the Derwent Valley. Parliamentary Secretary for Small Business and Trade, Adam Brooks MHA, said he had been delighted to present the state award to Reid Fruits. The business also took out the Agribusiness of the Year award. 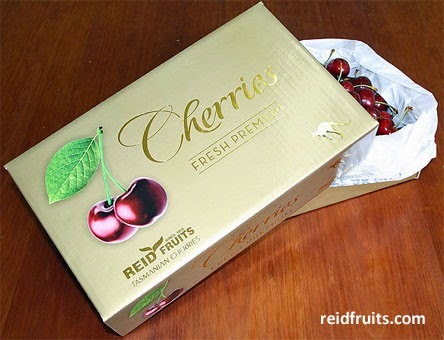 "Reid Fruits is one of Australia's largest cherry exporters and employs more than 80 people in regional Tasmania," Mr Brooks said. "They have recently modernised their cherry picking facility in the Huon Valley with the latest fibre optical and infrared packing equipment. This innovation and strategy has allowed the company to deliver premium quality cherries to over 20 different export destinations, meeting the specific consumer and cultural expectation of each market," he said. In the past year Reid Fruits has launched two new brands – “Gold Kangaroo” and “Red Kangaroo” –and these have been well received by export markets. These premium products have their own gilded and embossed cartons. Fresh cherries from Reid Fruits in Tasmania can be on supermarket shelves in China, Japan or the USA within four working days of harvest. The 2014 Tasmanian Export Awards were run by the Tasmanian Government’s Department of State Growth. All category winners progress to the Australian Export Awards presentation in Sydney next month.